I asked some friends to chime in with requests, and there’s a number of them here: Underworld, Severed Heads, Celebrate The Nun, L.A. Style, and Q-Feel. I’m always happy to take requests providing you understand the format. The version of Greater Reward is my own re-edit, done several years ago with Tom Ellard’s blessing. Severed Heads is a very important group for me, to the point that I have the cover of Bulkhead tattooed on my arm. Mmm… Skyscraper I Love You is dedicated to the one and only Skyscraper, Mr. Mark D. Hurte. The genderfuck drag he was doing in Lexington in the ’80s and ’90s would be right at home on RuPaul’s Drag Race today. Categories: The Beat Bash | Tags: Bronski Beat, Celebrate The Nun, Crystal Trip, Eartha Kitt, Hubert Kah, L.A. 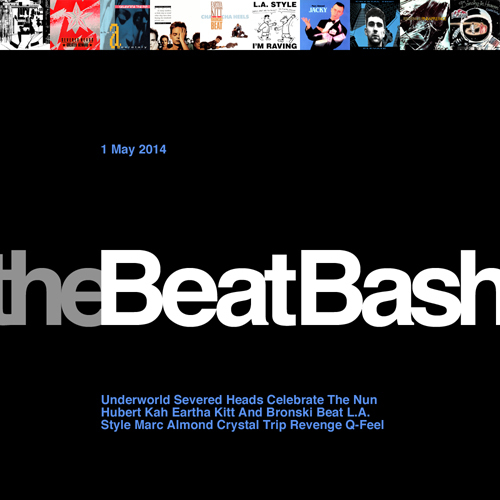 Style, Marc Almond, Q-Feel, Revenge, Severed Heads, Underworld | By: Jeb.